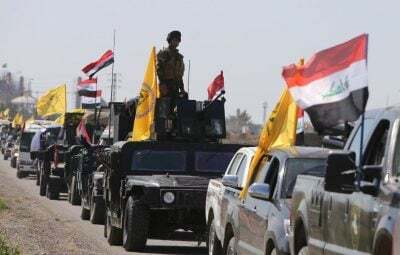 The Iraqi Popular Mobilization Units (PMU) have liberated 360 villages from ISIS terrorists west of Mosul, Abu Mahdi al-Muhandis, Deputy Commander of the PMU announced on June 10th. He added that PMU fighters “have also managed to kill 2,000 ISIS terrorists west of the northern province of Nineveh,” of which Mosul is the capital. The declaration followed a series of successful PMU operations aimed at reaching the border with Syria and liberating large areas from ISIS in western Nineveh. On April 25th, the PMU announced the start of the operation Muhammad Rasool Allah to liberate Hatar town located 80km south of Mosul. The town is located in a strategic area that links the provinces of Mosul, Salah al-Din and Al-Anbar. The operation was launched in full coordination with the Iraqi Army and was supported directly by the Iraqi Air Force. On April 28th, the PMU took full control of Hatar. The PMU revealed that several ISIS headquarters, including the governor of the state and the military force HQ, had been located there. The operation ended with the liberation of 1,500 square kilometers including 22 villages. As a result of the PMU operation, 253 ISIS militants were killed and 38 vehicles and VBIEDs were destroyed. The PMU launched a similar operation under the name “Muhammad Rasool Allah 2″ on May 12th. The aim of the first phase of the operation was the liberation of al-Qayrawan, 120km west of Mosul. ISIS used al-Qayrawan from which to launch several attacks with the aim of breaking the PMU siege of Tal Afar. By the fifth day of the operation, the PMU reached the village of Pashuk north of al-Qayrawan, the villages of Tal al-Dalaa’, and Thary al-Karah south of the town, and outflanked the ISIS stronghold. The first phase of Operation Muhammad Rasool Allah 2 ended on May 23rd, when the PMU launched a night attack on al-Qayrawan and liberated it. On May 25th, the PMU announced the start of the second phase of the operation “Muhammad Rasool Allah” under the name “Martyrs of Sinjar.” The declared goal of the operation was to capture the strategic town of Al-Baaj and to reach the Iraqi-Syrian border. Al-Baaj was located along the main supply line of ISIS between Syria and Iraq. On May 29th, the PMU reached the Syrian-Iraqi border after liberating a number of villages in western Nineveh. After that, the PMU began advancing west and southwest of Al-Baaj, encircling terrorists in the area. On June 4th, the PMU liberated Al-Baaj. The PMU described the town of Al-Baaj as “the secret capital of ISIS organization.” The town was allegedly a rear base for many ISIS commanders, including Abu Bakr al-Baghdadi. The PMU also liberated dozens of villages near al-Baaj. ISIS suffered notable losses in this battle and the remaining fighters reportedly withdrew towards the Sainiah desert and the towns of Al-Mayadeen and Al-Bukamal in the Syrian province of Deir Ezzor. The Iraqi Air Force participated in operations “Muhammad Rasool Allah 1” and “Muhammad Rasool Allah 2”. Iraqi warplanes and attack helicopters played an important role, destroying ISIS positions and fortifications in Hatar, al-Qayrawan, and Al-Baaj, as well as assisting PMU fighters to counter ISIS VBIEDs. Several PMU sources announced that the Qaim border crossing en route to Deir Ezzor may become the next target of the PMU in the area alongside the border with Syria. At the same time, the group spokesperson said that the PMU will not enter Syria before the full liberation of Iraq and that this move would require authorization by the Iraqi parliament. However, several PMU units are currently operating in Syria alongside forces loyal to the Damascus government. Members of the Al-Imam Ali Battalions and Harakat Hezbollah al-Nujaba are among these units. The PMU advance significantly decreased the ability of ISIS to operate in the Syrian-Iraqi border area and assisted the Syrian Arab Army in reaching the border with Iraq. ISIS units had repeatedly ignored the so-called US-led forces combating ISIS in southeastern Syria. In turn, they were constantly attacking Syrian government forces preventing their operations in the direction of Deir Ezzor and the Iraqi border area. Now, when the PMU and the Syrian Army have a direct link on the ground in southeastern Syria, it’s expected that Iran, which closely cooperates with the PMU, will soon be able to establish a ground supply line to Syria, boosting assistance to Syrian government forces in the country. At the same time, the ability of the PMU to control large parts of the border with Syria will boost the role of the group in Iraq.